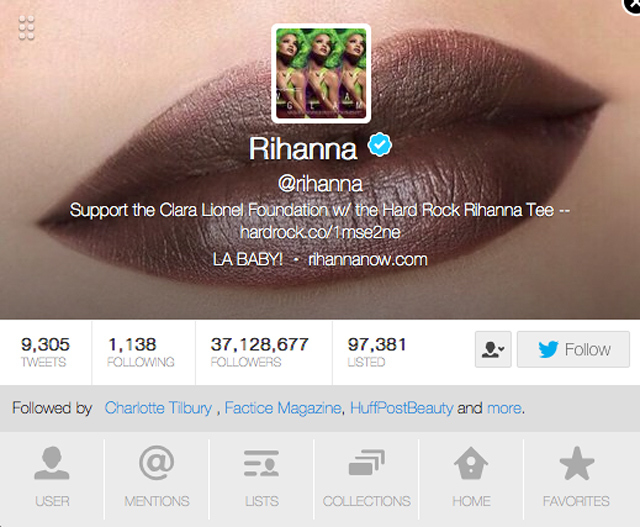 …And all of a sudden, you’re Rihanna’s Twitter header! “I would like to thank my mother, boyfriend, friends, and family. Oh, and let’s not forget MAC’s 231 brush!”. Even though I’ve already spent way too many tweets and an Instagram post on it. 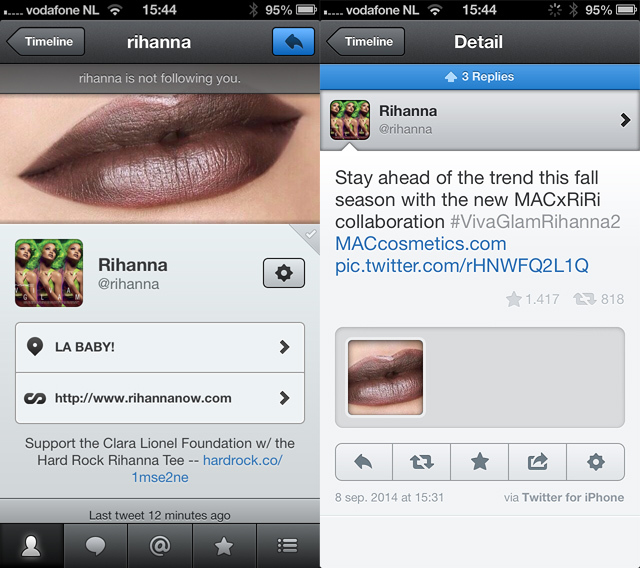 I wanted to let you guys know that today, out of nowhere, Rihanna decided to make my lips her Twitter header! Not only that, she also tweeted photos of my lips to promote the new MAC Viva Glam Rihanna 2 set—in-depth review here. I literally cried. I don’t know how, I don’t know why, but she did. And I’m floored. Thank you Rihanna, thank you so much! This entry was posted in Celebrity, Media, Misc.. Bookmark the permalink. 36 Responses to …And all of a sudden, you’re Rihanna’s Twitter header! WOW! Hoe gek, super voor je!! Wow!! Congratulations!! that is super cool! Wauw, dat is echt heel gaaf! Je verdient het. That’s absolutely AWESOME but… why didn’t she mention you as the author and editor? My first response as an intellectual property student is: Did she ask for your permission to use your photo? Or does she mention you in the credits somewhere? Because no matter how cool this is, you rights should not be violated! In case she did both: Congratulations! the same thing came up to my mind…it’s like Rihanna has claimed Nikkie’s picture her own just because HER lipstick was used in the lip makeup, without giving any credits to the picture/lips;) owner. Niet netjes dat ze je naam niet heeft vermeld! Jeetje wat een eer!!! Misschien moet je haar mailen, dat ze je foto’s mag gebruiken als je haar mag meeten hihi ;) Nee grapje, super leuk, gefeliciteerd!! Je verdient het, met je eeuwige perfecte swatches! Volgens mij weet Toeps wel raad met die copyright-infringement. As I saw it I was like “I save those lips somewhere… God, Nikkie’s?” and yeah, YOUR lips, can’t believe it. Congrats (is it appropriated ?) !!!! Echt supercool, alleen jammer dat ze je geen credits heeft gegeven. Wow that is so awesome! GO NIKKIE! Wauw, hoe gaaf is dat!! Gefeliciteerd, je verdient het, want je foto’s en make-up skills zijn ook gewoon awesome! OMG! How freaking awesome is that! Totally amazing. You go girl. Your lips are def stunning and beautiful. :) Congrats. GEK! SUPER!! You deserve this so much!! Wahoooooooooooooooe! !